If there was ever any proof needed that Southern Rock had finally come into the spotlight in 1980, it is the fact that some corporate record executive had the bright idea to put out a compilation album of great Southern Rock songs. I first saw this album on record store shelves in the summer of 1980 and almost after it appeared, advertisements for it began playing on radio and television. I had heard most of the songs previous to this album and now there was an album where I could listen to them all together. “Southern Fried Rock” is full of great songs featuring classics like “Ramblin’ Man” from the Allman Brothers and the Charlie Daniels Band classic “The Devil Went Down to Georgia.” There is also a lot of variation on the album with slower songs like “So Into You” by the Atlanta Rhythm Section and the big country/rock crossover from the Pure Prairie League, “Amie” to rock outs like “Flirtin’ With Disaster” from Molly Hatchet, “Train Train” from Blackfoot and 38 Special’s “Rockin’ Into the Night.” This album has it all in terms of Southern rock with fifteen great songs. If I had to nit pick at this album, it is the fact that there are no Lynyrd Skynyrd songs on it. 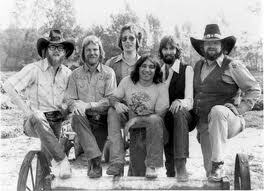 They were one of the most influential Southern Rock bands and it is a travesty that none of their songs are on it. Still, this is a fantastic album for anyone who wanted to investigate some of the great gems “Southern Fried Rock” has to offer. This entry was posted on June 17, 2013 at 2:47 am and is filed under 1980s, Music, Rock, Uncategorized with tags 38 Special, Blackfoot, Charlie Daniels, Classic Rock, Flirtin With Disaster, hard rock, Heavy Metal, Lynyrd Skynyrd, Molly Hatchet, Southern Rock, The Allman Brothers, The Devil Went Down to Georgia. You can follow any responses to this entry through the RSS 2.0 feed. You can leave a response, or trackback from your own site. When I was in high school I was a big southern rock fan. I loved Lynard Skynyrd, Molly Hatchet, The Allman Brothers and Blackfoot. I saw Rosington Collins in concert with Dale Kratz singing, with Rossington and Collins. I remember she was with one of them romantically but I forget which one. They did Free Bird at the end of the concert. I still remember everyone holding up their lighters and singing along. I heard similar things said by people who had seen Rossington/Collins in concert. It sounds that they were really good. This was our unofficial cruise and booze 8 track. I agree that there were a couple of tracks that would have left out such as Elvin Bishop and ARS and replaced them with Nitty Gritty Dirt Band, ZZTop or maybe a CDB song, but overall, it was the best I’ve seen. Thanks it is a great album to booze and cruise to. I thought there should have been a Skynyrd track on it.